(Nanowerk News) University of Alabama at Birmingham researchers have created a small molecule that prevents or impedes tooth cavities in a preclinical model. The inhibitor blocks the function of a key virulence enzyme in an oral bacterium, a molecular sabotage that is akin to throwing a monkey wrench into machinery to jam the gears. In the presence of the molecule, Streptococcus mutans -- the prime bacterial cause of the tooth decay called dental caries -- is unable to make the protective and sticky biofilm that allows it to glue to the tooth surface, where it eats away tooth enamel by producing lactic acid. This selective inhibition of the sticky biofilm appears to act specifically against S. mutans, and the inhibitor drastically reduced dental caries in rats fed a caries-promoting diet. "Our compound is drug-like, non-bactericidal and easy to synthesize, and it exhibits very potent efficacy in vivo," the researchers explained in an article in Scientific Reports ("Structure-Based Discovery of Small Molecule Inhibitors of Cariogenic Virulence"). It is "an excellent candidate that can be developed into therapeutic drugs that prevent and treat dental caries." This is Sadanandan Velu and Hui Wu. About 2.3 billion people worldwide have dental caries in their permanent teeth, according to a 2015 Global Burden of Disease study. Current practices to prevent cavities, such as mouthwash and tooth brushing, indiscriminately remove oral bacteria through chemical and physical means, and have limited success. Caries is the Latin word for rottenness. "If we have something that can selectively take away the bacteria's ability to form biofilms, that would be a tremendous advance," said Sadanandan Velu, Ph.D., associate professor of chemistry in the UAB College of Arts and Sciences, and a lead researcher in the study. "This is particularly exciting in the broad sense of targeting microbiota using chemical probes tailored to the specific pathogen within a complex microbial community," said Hui Wu, Ph.D., professor of pediatric dentistry, UAB School of Dentistry, director of UAB Microbiome Center, and a lead investigator in the study. "Successful development of this selective lead inhibitor in the dental setting offers a proof of concept that selective targeting of keystone bacteria is promising for the design of new treatments," Wu said. "This is relevant for many elusive human diseases as the microbiome is being linked to overall health and disease." 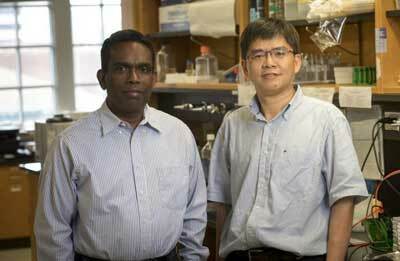 Wu's expertise is bacteriology and biochemistry, and Velu's is structure-based drug design. Their interdisciplinary study also included researchers from the Department of Microbiology in the UAB School of Medicine. The glucan biofilm is made by three S. mutans glucosyltransferase, or Gtf, enzymes. The crystal structure of the GtfC glucosyltransferase is known, and the UAB researchers used that structure to screen -- via computer simulations -- 500,000 drug-like compounds for binding at the enzyme's active site. Ninety compounds with diverse scaffolds showing promise in the computer screening were purchased and tested for their ability to block biofilm formation by S. mutans in culture. Seven showed potent, low-micromolar inhibition, and one, #G43, was tested more extensively. #G43 inhibited the activity of enzymes GtfB and GtfC, with micromolar affinity for GtfB and nanomolar affinity for GtfC. #G43 did not inhibit the expression of the gtfC gene, and it did not affect growth or viability of S. mutans and several other oral bacteria tested. Also, #G43 did not inhibit biofilm production by several other oral streptococcal species. In the rat-model of dental caries, animals on a low-sucrose diet were infected with S. mutans and their teeth were treated topically with #G43 twice a day for four weeks. The #G43 treatment caused very significant reductions in enamel and dentinal caries. "In conclusion," Wu and Velu wrote in their paper, "using structure-based design, we have developed a unique low-micromolar biofilm inhibitor that targets S. mutans Gtfs through binding to key virulence factors, Gtfs."